THE PRESIDENT: As President and Commander-in-Chief, my first and most important responsibility is keeping the American people safe. And that means that we make sure that our military is properly funded, and that our men and women in uniform get the support, the equipment, the support for their families that they need and deserve when they protect our freedom and our safety. The bill that has been presented to me authorizing our defense — excuse me — the bill that’s before me, authorizing our defense spending for this year, does a number of good things. It makes sure that our military is funded. It has some important provisions around reform for our military retirement system, which is necessary to make sure that it is stable and effective. It’s got some cybersecurity provisions that are necessary for an increasing threat. Unfortunately, it falls woefully short in three areas. Number one, it keeps in place the sequester that is inadequate for us to properly fund our military in a stable, sustained way and allows all of our armed forces to plan properly. I have repeatedly called on Congress to eliminate the sequester and make sure that we’re providing certainty to our military so they can do out-year planning, ensure military readiness, ensure our troops are getting what they need. This bill instead resorts to gimmicks that does not allow the Pentagon to do what it needs to do. Number two, unfortunately it prevents a wide range of reforms that are necessary for us to get our military modernized and able to deal with the many threats that are presenting themselves in the 21st century. We have repeatedly put forward a series of reforms eliminating programs that the Pentagon does not want — Congress keeps on stepping back in, and we end up wasting money. We end up diverting resources from things that we do need to have the kind of equipment and training and readiness that are necessary for us to meet all potential threats. And the third thing is that this legislation specifically impeded our ability to close Guantanamo in a way that I have repeatedly argued is counterproductive to our efforts to defeat terrorism around the world. Guantanamo is one of the premiere mechanisms for jihadists to recruit. It’s time for us to close it. It is outdated; it’s expensive; it’s been there for years. And we can do better in terms of keeping our people safe while making sure that we are consistent with our values. So I’m going to be vetoing this authorization bill. I’m going to be sending it back to Congress. And my message to them is very simple: Let’s do this right. We’re in the midst of budget discussions — let’s have a budget that properly funds our national security as well as economic security. Let’s make sure that we’re able, in a constructive way, to reform our military spending to make it sustainable over the long term, and let’s make sure that, in a responsible way, we can draw down the populations in Guantanamo, make sure that the American people are safe, and make sure that we’re not providing the kinds of recruitment tools to terrorists that are so dangerous. THE PRESIDENT: Hello, Newport News! (Applause.) Well, it is good to see all of you here today. In a few days, Congress might allow a series of immediate, painful, arbitrary budget cuts to take place — known in Washington as the sequester. Now, that’s a pretty bad name — sequester. But the effects are even worse than the name. Instead of cutting out the government spending we don’t need — wasteful programs that don’t work, special interest tax loopholes and tax breaks — what the sequester does is it uses a meat cleaver approach to gut critical investments in things like education and national security and lifesaving medical research. And the impact of this policy won’t be felt overnight, but it will be real. The sequester will weaken America’s economic recovery. It will weaken our military readiness. And it will weaken the basic services that the American people depend on every single day. That’s what we should be talking about in Washington. And if you agree with me, I need you to make sure your voices are heard. Let your leaders know what you expect of them. Let them know what you believe. Let them know that what this country was built on was a sense of obligation to not just each other but to future generations; that we’ve got to shoulder those obligations as one nation, and as one people. That’s all I want. I want us to be able to look back five years from now, 10 years from now, and say we took care of our business and we put an end to some of these games that maybe, I guess, are entertaining for some but are hurting too many people. But in order for us to make that happen I’m going to need you. The one thing about being President is, after four years you get pretty humble. (Laughter.) You’d think maybe you wouldn’t, but actually you become more humble. You realize what you don’t know. You realize all the mistakes you’ve made. But you also realize you can’t do things by yourself. That’s not how our system works. You’ve got to have the help and the goodwill of Congress, and what that means is you’ve got to make sure that constituents of members of Congress are putting some pressure on them, making sure they’re doing the right thing, putting an end to some of these political games. President Obama on Friday praised outgoing Defense Secretary Leon Panetta for strengthening the military and making the nation better prepared to meet future challenges. 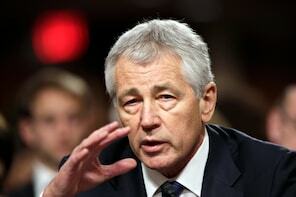 Whatever happened to Chuck Hagel’s nomination to become the next secretary of defense? Following a contentious hearing last week in which Republicans on the Senate Armed Services Committee raised serious concerns about President Obama’s pick to head the Pentagon, a vote was scheduled by the panel Wednesday to determine if the nomination would advance to the full Senate. Secretary of Defense Leon Panetta said Thursday that the automatic budget cuts prescribed in the sequestration legislation would undermine the Department of Defense’s ability to fulfill its responsibility to protect American citizens. “This will badly damage our national defense and compromise our ability to respond to crises in a dangerous world,” Panetta told senators at a Senate Armed Services Committee hearing on the Pentagon’s response to the attack on the U.S. consulate in Benghazi, Libya, that killed four Americans, including U.S. Ambassador Christopher Stevens. The following is Chuck Hagel’s opening remarks to the Senate Armed Services Committee, as prepared for delivery. Thank you Chairman Levin, Ranking Member Inhofe, and Distinguished Members of the Committee. I am honored to come before you today as the President’s nominee to be Secretary of Defense. I want to thank my friends Sam Nunn and John Warner for their support, encouragement, and friendship over many years. These two distinguished Americans represent what’s best about American public service and responsible bipartisanship. They have embodied both in their careers and are models for each of us. To my family, friends, and fellow veterans who are here this morning – and those who are not – thank you. A life is only as good as the family and friends you have and the people you surround yourself with. I also want to thank my friend Leon Panetta for his tremendous service to our country over so many years. If I’m given the privilege of succeeding him, it will be a high honor. who are called on to make the enormous sacrifices of military service. Their safety, success, and welfare will always be at the forefront of the decisions I make. Our nation’s security is the highest priority of our leaders and our government. We cannot allow the work of confronting the great threats we face today to be held hostage to partisanship on either side of the aisle, or by differences between the bodies represented in Articles I and II of our Constitution. The stakes are too high. Men and women of all political philosophies and parties fight and die for our country. As this Committee knows so well, protecting our national security or committing a nation to war can never become political litmus tests. I know Secretary Panetta has put a strong emphasis on reaching out to the Congress. I, like Leon, come from the Congress, and respect and understand this institution’s indispensable role in setting policy and helping govern our country. experiences. They help instruct our judgments. We build out from those personal foundations by continually informing ourselves, listening, and learning. Like each of you, I have a record. A record I am proud of, not because of any accomplishments I may have achieved, or an absence of mistakes, but rather because I’ve tried to build that record by living my life and fulfilling my responsibilities as honestly as I knew how and with hard work. Under-pinning everything I’ve done in my life was the belief that we must always be striving to make our nation a better and more secure place for all of our people. During the twelve years I had the privilege of serving the people of Nebraska in the United States Senate, I cast over 3,000 votes and hundreds of Committee votes. I’ve also given hundreds of interviews and speeches, and written a book. So, as you all know, I am on the record on many issues. But no one individual vote, quote, or statement defines me, my beliefs, or my record. My overall worldview has never changed: that America has and must maintain the strongest military in the world; that we must lead the international community to confront threats and challenges together; and that we must use all tools of American power to protect our citizens and our interests. I believe, and always have, that America must engage – not retreat – in the world. My record is consistent on these points. It’s clear that we are living at a defining time. Our nation is emerging from over a decade of war. We have brought our men and women in uniform home from Iraq, and have started to bring them home from Afghanistan. technologies, economies, and threats are bringing the seven billion global citizens closer together. And as our planet adds another two billion people over the next 25 years, the dangers, complications, and human demands will not be lessened, but rather heightened. Despite these challenges, I believe we also have historic opportunities to help build a safer, more prosperous, more secure, more hopeful and just world than at maybe any time in history. Yes, the curse of intolerance, hatred, and danger exists around the world, and we must continue to be clear-eyed about this danger – and we will be. We will not hesitate to use the full force of the United States military in defense of our security. But we must also be smart, and more importantly wise, in how we employ all of our nation’s great power. America’s continued leadership and strength at home and abroad will be critically important for our country and the world. While we will not hesitate to act unilaterally when necessary, it is essential that we work closely with our allies and partners to enhance America’s influence and security – as well as global security. If confirmed, I will continue to build on the efforts of this administration and of former Secretary Gates, Secretary Panetta, and Secretary Clinton to strengthen our alliances and partnerships around the world. I will also look forward to working with my former Senate colleague and friend, John Kerry, in this effort. First, we have a plan in place to transition out of Afghanistan, continue bringing our troops home, and end the war there – which has been the longest war in America’s history. As you know, discussions are ongoing about what the U.S. presence in Afghanistan will look like after 2014. The President has made clear – and I agree – that there should be only two functions for U.S. troops that remain in Afghanistan after 2014: counterterrorism – particularly to target al Qaeda and its affiliates, and training and advising Afghan forces. It’s time we forge a new partnership with Afghanistan, with its government and, importantly, with its people. Third, as I have made clear, I am fully committed to the President’s goal of preventing Iran from obtaining a nuclear weapon, and – as I’ve said in the past – all options must be on the table to achieve that goal. My policy is one of prevention, and not one of containment – and the President has made clear that is the policy of our government. As Secretary of Defense, I will make sure the Department is prepared for any contingency. I will ensure our friend and ally Israel maintains its Qualitative Military Edge in the region and will continue to support systems like Iron Dome, which is today saving Israeli lives from terrorist rocket attacks. Fourth, while we pursue the reductions in our deployed stockpiles and launchers consistent with the New START Treaty, I am committed to maintaining a modern, strong, safe, ready, and effective nuclear arsenal. America’s nuclear deterrent over the last 65 years has played a central role in ensuring global security and the avoidance of a World War III. I am committed to modernizing our nuclear arsenal. As we emerge from this decade of war, we also must broaden our nation’s focus overseas as we look at future threats and challenges. As this Committee knows, that’s why DoD is rebalancing its resources towards the Asia-Pacific region. We are in the process of modernizing our defense posture across the entire region to defend and deepen our partnerships with traditional allies, especially Japan, South Korea, and Australia; to continue to deter and defend against provocations from states like North Korea, as well as non-state actors; and to expand our networks of security cooperation throughout the region to combat terrorism, counter proliferation, provide disaster relief, fight piracy, and ensure maritime security. I will continue this rebalancing, even as we continue to work closely with our longtime NATO allies and friends, and with allies and partners in other regions. At the same time, we will continue to focus on challenges in the Middle East and North Africa, where we have clear national interests. Rather, it is a recognition that the United States has been and always will be a Pacific power, and the Asia- Pacific is an increasingly vital part of the globe for America’s security and economy. That’s why we must become even more engaged in the region over the coming years. who has run businesses, I know the uncertainty and turbulence of the current budget climate makes it much more difficult to manage the Pentagon’s resources. If confirmed, I am committed to effectively and efficiently using every single taxpayer dollar; to maintaining the strongest military in the world; and to working with Congress to ensure the Department has the resources it needs – and that the disposition of those resources is accountable. Even as we deal with difficult budget decisions, I will never break America’s commitment to our troops, our veterans, and our military families. We will continue to invest in the well-being of our all-volunteer force. And, working with the VA and other institutions, we will make sure our troops and their families get the health care, job opportunities, and education they have earned and deserve – just as I did when I co-authored the Post-9/11 G.I. Bill with Senators Jim Webb, John Warner, and Frank Lautenberg. This includes focusing on the mental health of our fighting force, because no one who volunteers to fight and die for our country should feel like they have nowhere to turn. In my twelve years in the Senate, my one guiding principle on every national security decision I made and every vote I cast was always this: Is our policy worthy of our troops and their families and the sacrifices we ask them to make? That same question will guide me if I am confirmed as Secretary of Defense. Our men and women in uniform and their families must never doubt that their leaders’ first priority is them. I believe my record of leadership on veterans issues over the years – going back to my service in the Veterans Administration under President Reagan – demonstrates my rock-solid commitment to our veterans and their families. We must always take care of our people. That’s why I will work to ensure that everyone who volunteers to fight for this country has the same rights and opportunities. As I’ve discussed with many of you in our meetings, I am fully committed to implementing the repeal of Don’t Ask, Don’t Tell and doing everything possible under current law to provide equal benefits to the families of all our service members. I will work with the service chiefs as we officially open combat positions to women, a decision that I strongly support. And I will continue the important work that Leon Panetta has done to combat sexual assault in the military. Maintaining the health and well-being of those who serve is critical to maintaining a strong and capable military, because an institution’s people must always come first. As we look ahead to the coming years, we have an extraordinary opportunity now to define what’s next for America’s military and our country. It is incumbent upon all of us to make decisions that will ensure our nation is prepared to confront any threat we may face, protect our citizens, and remain the greatest force for good in the world. If confirmed as Secretary of Defense, it will be my great honor – working with the President, this Committee, the Congress, and our military – to ensure our policies are worthy of the service and sacrifice of America’s finest men and women. Thank you. I look forward to your questions.